The autumnal equinox and the fall season officially begin on September 22, signaling the start of the school year for kids and a return to normal work routines for the rest of the country as well as the arrival of cooler weather for much of the United States. Despite the end of lazy summer days, September is a great month for traveling—crowds will have dissipated, but the sunshine and warm weather remain for most of the month. Simmering August temperatures mellow into crisp, clear days of September that are great for outdoor activities like discovering local attractions and hiking in national parks across the country. In the latter part of September, the greenery of summer starts to fade to the brilliant oranges and yellows of the fall season. New York and Massachusetts colors won’t reach their peak until the beginning of October when the temperatures really start to drop, but places that get chilly quickly, like northern Maine and the mountain areas of Colorado, will see a dazzling fall show in mid- to late-September. Booking travel should be relatively easy this month with the exception of Labor Day weekend, which will see an influx of end-of-season vacationers taking their last holiday trip of the summer. Otherwise, you should be fine to book your accommodations and reservations in most cities on short notice and still get some great deals. June 1 signals the beginning of hurricane season for both the Atlantic and Eastern Pacific regions, which lasts through the end of September. As a result, traveling to coastal destinations like Florida during hurricane season can be treacherous as flights are often delayed due to the storms. Although it's almost impossible to plan for natural disasters like these, knowing where they can strike can help you better avoid unexpected complications while traveling. Hurricanes that form in the Atlantic Ocean will likely affect eastern coastal states from Florida to Maine as well as along the Gulf Coast from Texas to Georgia. Meanwhile, storms that form over the Eastern Pacific rarely make landfall, but if they get close enough to soak the Southwestern states of Arizona, New Mexico, Utah, and Colorado as well as Hawaii. If you're traveling to coastal beach destinations to soak up the last of the summer sun, be sure to check local weather forecasts in the days leading up to your departure and keep an eye on hurricanes forming in the Atlantic or Pacific Oceans. Your suitcase will look different depending on where you travel in the United States come summer. Unless you're traveling to foggy San Francisco or planning on camping overnight in high-elevation destinations like the Grand Canyon, you won't need to pack anything more than a light sweater for chilly nights. Since most of the southern United States is still experiencing warm days and only slightly colder nights, you can still pack your shorts, T-shirts, tank tops, and sneakers for most destinations. Labor Day: You can kick off September with Labor Day events across the country celebrated on the first Monday of the month, which makes a great excuse to take one last trip before school or work starts again. If you’re looking for a beach visit, head to the Northern California-Reno border at Lake Tahoe to spend a day on the lake and catch the annual Labor Day fireworks show. Oktoberfest: Cities across America begin to celebrate the German holiday of Oktoberfest in mid-to-late September. Jazz Festival, Chicago: Many destinations host festivals and other events to mark the changing of the seasons, celebrating fall with music, food, and family-friendly events. For instance, Chicago puts on its annual jazz festival in Millennium Park featuring four days of free music. September is considered the start of shoulder season for much of the United States (with the exception of Labor Day), which means that major airlines, hotels, resorts, and even local restaurants and venues offer special deals on accommodations, dining, and experiences to entice more travelers as the summer rush starts to end. 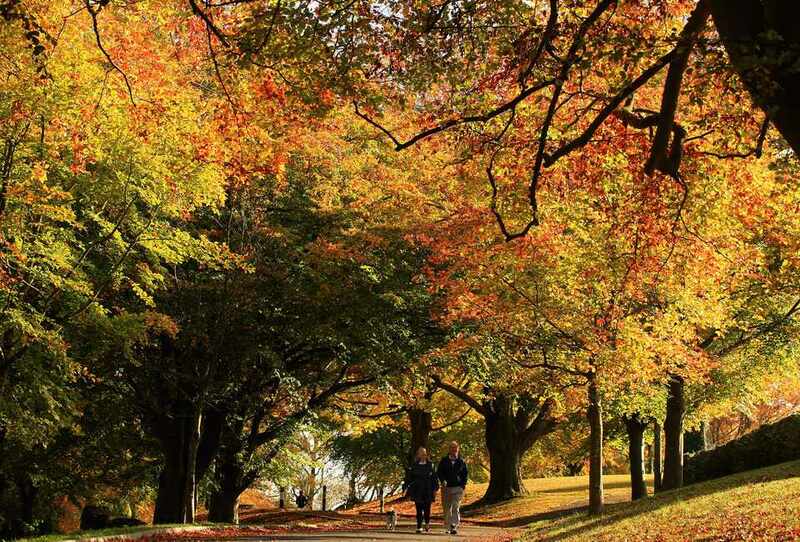 If you want to go leaf-peeping, you'll need to wait until October or November. In September, the trees are typically still green, even though it's technically fall.